It's More Than A Finishing Touch -- It's A Buttonhole Stitching! Buttonhole stitch...you see the words over and over in descriptions of antique and vintage linens. It's such a small, common thing; why do sellers keep making such a point? There is a reason. 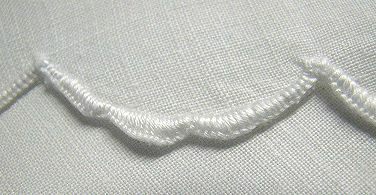 Buttonhole stitch is most often used to keep the edges of the fabric from fraying. It is a necessary finishing for scallops, cutwork lace and more. 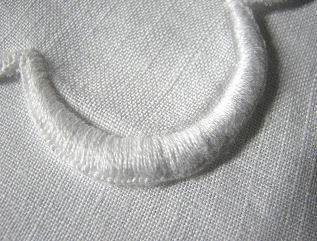 A buttonhole stitch is a two-step process. 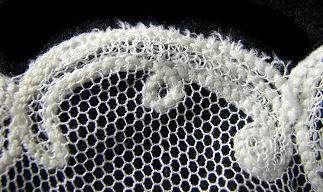 Part of the stitch covers the rough edge of the fabric, a knot at the very outside of that stitch prevents fabric and stitches from unraveling. 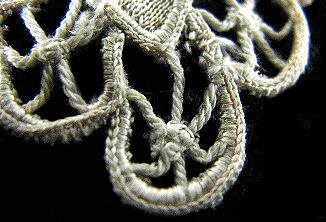 EACH and EVERY stitch has the knot! You can recognize the buttonhole stitch by that outer row of knots, like tiny beads around the edge. For added strength and appeal the seamstress may begin with rows and layers of stitches to form a three-dimensional padding underneath the buttonhole stitching. Obviously, buttonhole stitching is a time-consuming and tediuos occupation. Look at the buttonhole on your shirt or dress. Unbutton it and pull the hole open a bit. Is the edge a little fuzzy? There are no little knots; the machines can't do them. Not buttonhole stitched -- see what happens! The longer that you keep buttoning, unbuttoning and laundering that shirt, the fuzzier the holes become, until eventually the buttons won't stay in the holes. Of course, we don't keep our shirts that long, and the manufacturers know it! But, fine handmade linens were made to be handed down from mother to daughter, to granddaughter and so on and so on. These homemade works of art will be beautiful and cherished still; that shirt will be long gone. Our grandmothers spent lifetimes perfecting lacemaking and embroidery skills to produce heirloom quality linens for their families. They wouldn't risk losing them to unsightly and damaging frays, sure to appear in generations to come. Close, tight, neat buttonhole stitching was a required skill for every seamstress. So, when assesing vintage and antique linens, look for the buttonhole stitch on the edges.  It assures you that the item is handmade and well made. In general, if the buttonhole stitching is close and precise, the overall workmanship will be of high quality also.